Milk protein is a common food allergy, especially among children. According to the American Academy of Allergy Asthma and Immunology, milk protein is the second most common allergy after peanuts. While adults can be allergic to milk, milk protein allergy prevalence is higher among children -- affecting about 2.5 percent of kids younger than age 3. Most young children eventually outgrow milk allergies by about age 5, but some do not, and symptoms can be serious. Therefore, knowing how to spot symptoms of a milk protein allergy is important. Symptoms below should go away after you (or your child) cut out milk products, but immediate medical attention is necessary for serious side effects like difficulty breathing. Hives and itchy skin rashes, especially around the mouth area, are common symptoms of a milk allergy according to the Asthma and Allergy Information Association (AAIA). Facial flushing may also occur. Hives, also known as urticaria, often look like big red welts or raised bumps that turn white when you press on them. A skin rash resulting from milk allergy may also appear as eczema, and can be red or skin colored. Hives usually appear immediately after consuming milk or milk products, while an itchy skin rash may take a little longer to develop. Do Premature Birth and Food Allergies Go Together? If you or your child experience upset stomach or abdominal cramps after consuming milk products, you could have a milk allergy. However, abdominal distress is also a sign of lactose intolerance, which means the body is sensitive to a sugar in milk called lactose, not milk protein itself. Viruses, some medications, food poisoning, and other gastrointestinal disorders can also cause stomach upset and cramping, so it may be difficult to attribute such symptoms to milk allergy unless you're experiencing other allergic reactions. Infants can't tell you what's wrong but if your baby is irritable or has colic, especially around feeding time, it could be a sign of milk protein allergy according to Today's Dietician. Try switching to a formula that doesn't contain cow's milk proteins, such as soy-based infant formulas. If you're breastfeeding your baby, eliminate milk and milk products to see if the colic and irritability resolves. Talk with your doctor about a milk protein allergy for babies who gag during feedings or refuse milk or formula when they should be hungry. While there are many reasons your baby won't eat or gags during feedings, such symptoms mean it's time to rule out a milk allergy by eliminating dairy proteins or getting tested for allergies by a doctor. If you constantly have a runny nose or watery eyes, you might have seasonal allergies, but you could also have a food allergy, according to Mayo Clinic. 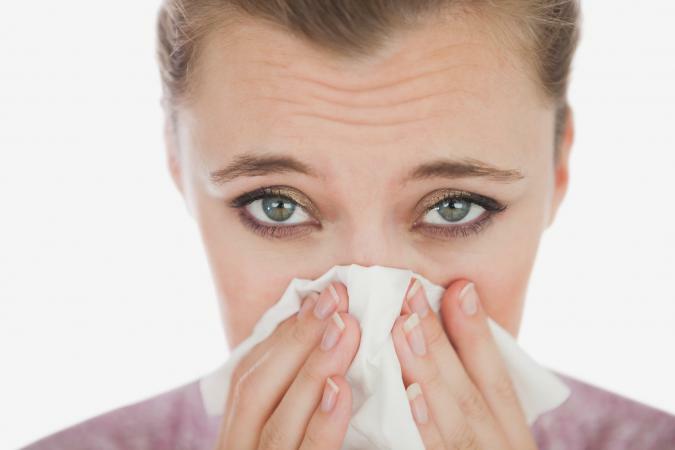 After eliminating milk products for several days, such symptoms should disappear if a milk protein allergy is indeed the cause of your runny nose and watery eyes. Are you or your child experiencing bloody, loose stools or diarrhea shortly after ingesting milk products? If so, a milk allergy may be to blame. Diarrhea has many other causes besides food allergies -- like lactose intolerance, certain medications, or a virus -- but if diarrhea doesn't go away within a few days or your stools are bloody, it's time to see a doctor. According to the National Food Service Management Institute, wheezing is a symptom that occurs immediately after ingesting milk protein in people with a milk allergy, while coughing is a symptom that can take more time to develop. Either way, if you or your baby or child start to wheeze or cough after ingesting milk products and experiences other symptoms of milk allergies, cut out milk protein to see if symptoms disappear. Vomiting is another symptom of milk protein allergy that occurs immediately after milk consumption, notes Mayo Clinic. But vomiting can also happen if you are lactose intolerant. If vomiting persists for several days, or if you cut out milk and vomiting continues, talk with your doctor to find out why this is happening to you. Difficulty breathing due to swelling of the airway can cause a drop in blood pressure, dizziness, or even fainting when you have a milk allergy, according to the American College of Allergy, Asthma, and Immunology. Such symptoms can be life threatening, so seek medical attention immediately any time you're feeling faint or can't breathe well. Anaphylaxis is a life-threatening condition that not only leads to difficulty breathing and low blood pressure, but can cause the body to go into shock and even lose consciousness. Because anaphylaxis is such a serious symptom of milk allergy, the Food Allergy Research and Education recommends people with milk allergies carry an epinephrine shot (EpiPen) with them at all times. Milk allergy and lactose intolerance have some of the same symptoms but are very different medical conditions. A milk allergy means you're allergic to proteins in cow's milk and milk products, and lactose intolerance occurs when your body has trouble digesting lactose, a sugar found in milk. 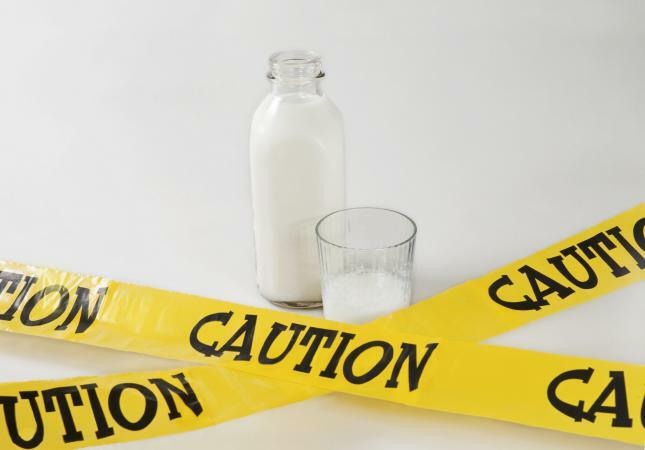 Milk allergy symptoms can be much more serious than lactose intolerance, but some symptoms these two conditions share include diarrhea, abdominal cramps, and vomiting. Additional symptoms of lactose intolerance include nausea, gas, and bloating. It can be difficult to distinguish between a milk allergy and other food allergies because many symptoms are the same. As with milk allergy side effects, symptoms of a peanut allergy include hives or a rash around the mouth, diarrhea, upset stomach, cramps, vomiting, wheezing, runny nose, and anaphylaxis. The best way to know which type of food is causing symptoms is to eliminate the food in question from your diet for several days at a time -- or get allergy tested by your doctor. If you experience symptoms of a milk protein allergy after consuming milk or milk products, cut out dairy foods to see if symptoms disappear. This means eliminating not only milk, but yogurt, cheese, cream, ice cream, butter, cottage cheese, pudding, sour cream, and half and half. In addition, avoid protein powders containing casein or whey protein. If you suspect you or your child has a milk allergy, it's time to check in with your doctor. He or she may suggest a skin or blood test to find out for sure if you're allergic to milk. If you're experiencing a severe allergic reaction, such as anaphylaxis or difficulty breathing, seek immediate medical attention or call 911. Having a milk allergy means you can still live a normal, healthy lifestyle by simply choosing dairy-free foods to meet your body's nutrient needs. Soymilk and protein-fortified almond milk are protein-rich alternatives to cow's milk that contain similar nutrients. If your child has a milk allergy, chances are pretty good he or she will eventually outgrow it.